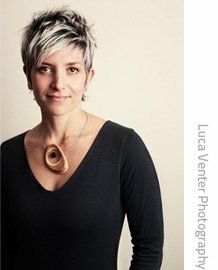 Learn more about Denver artist Tandi Venter. A native of South Africa, Tandi studied graphic design at the Johannesburg Art Foundation. Her love of mid-century modern design inspires playful, yet sophisticated, pieces that compliment contemporary spaces. ''I’d describe my style as clean and minimal. A self-taught painter, Tandi displays a strong understanding of geometric structure. Her art’s expressionism takes its inspiration from nature and landscape, the commonplace and the abstract. Broad vistas and horizontal plains in her Retroscapes offer an atmosphere of stillness and balance, while her Pebblestacks exhibit a surprising sense of stability through their precarious placement. The vibrancy of her palette together with the quietude of an uncluttered canvas present something spiritual. Tandi's paintings emerge through multiple layers of glaze, and a process of addition and subtraction which leaves faint traces of the canvas' history. Her brush strokes form a sheer, linen veil at each layer. The faux bois (fake wood) painted in most of her artworks, amaze the viewer with its realism. Her artwork has long enhanced the spaces of private collectors, and is widely recognized within the hospitality, commercial, and domestic decor industries, both nationally and internationally. A passion for culinary arts and music also compliment Tandi’s expressive life. She currently lives in Denver with her husband, Marcel and their sons, Tyler and Luca.